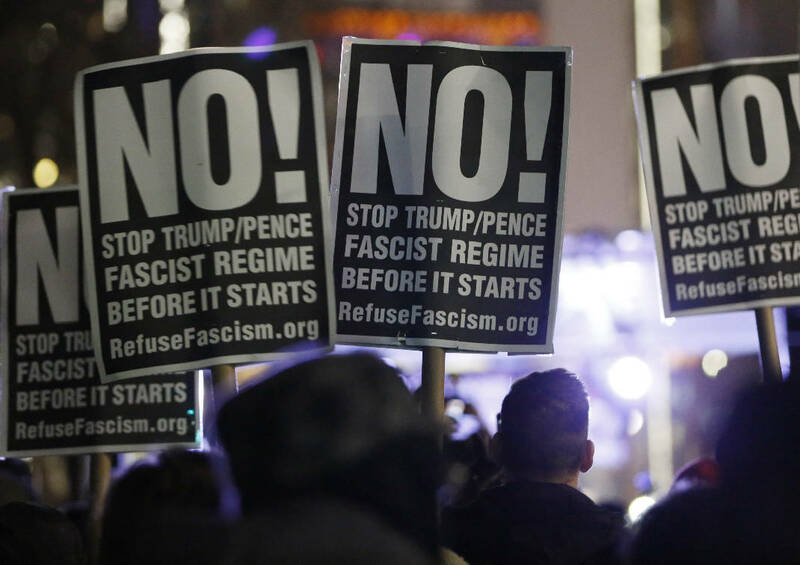 WASHINGTON (AP) — Police deployed pepper spray in a chaotic confrontation blocks from Donald Trump's inauguration Friday as protesters registered their rage against the new president. Spirited demonstrations unfolded peacefully at various security checkpoints near the Capitol as police helped ticket-holders get through to the inaugural ceremony. Signs read, "Resist Trump Climate Justice Now," ''Let Freedom Ring," ''Free Palestine." But at one point, police gave chase to a group of about 100 protesters who smashed the windows of downtown businesses as they denounced capitalism and Trump. Police in riot gear used pepper spray from large canisters and eventually cordoned off the protesters. The demonstrators shouted, "Hands up, don't shoot," echoing a slogan adopted at protests after police shot Michael Brown to death in 2014 in Ferguson, Missouri. The confrontation happened about an hour before Trump was sworn in at the Capitol. Closer to that scene, lines for ticket-holders entering two gates stretched for blocks at one point as protesters clogged entrances. More demonstrations were planned for later in the day. The "Festival of Resistance" march ran about 1.5 miles to McPherson Square, a park about three blocks from the White House, where a rally featuring the filmmaker and liberal activist Michael Moore was planned.